Yet another proof that there are countless of great movies ready to be rediscovered in the vowels of movie history. Colossus: The Forbin Project is a masterful thriller that succeeds in every possible regard and literally held me on the edge of my seat for its brief 95 minutes. Makes me wonder why do I waste my time with the banal stuff that we must endure these days when we can go back in time and relive these great classics. The fact that I saw Colossus for the first time 30 years after its initial release in 1970 and it was so bloody effective, is a testament to what makes great movie making. First and foremost, Colossus is pure Science Fiction — I don’t think anything like it has been filmed in ages. In very lose terms, the movie – which is based on a series of books by D.F. Jones – is about a government secret mega-project to build a powerful defense supercomputer, created by Dr. Charles Forbin. Eventually, this machine called Colossus becomes sentient and decides to fix all the problems of humankind by means of its own cold and radical methods, such as bombing whoever disobeys its orders. The plot is well devised and works wonderfully – most importantly, we’re offered believable scientific and technical explanations regarding the construction and behavior of Colossus, at least by the standards of the 70’s. Sure, some aspects of the story may have aged by now, but the basic concept remains quite in force. For instance, we soon learn into the movie that another supercomputer was being built secretly in Russia and it’s put in functioning around the same time that Colossus is fully operational. Both machines “meet” each other through a worldwide network of sorts (the internets!) and engage in talks. Now, in the Hollywood lore of today these machines would magically understand each other in a matter of a few seconds, but in Colossus – which is about serious Sci-Fi – first they must develop a common base to dialogue (a protocol, basically). They start by exchanging the times tables just to make sure they are working on the same mathematical grounds and soon they output elaborate equations and formulae. While the speechless group of scientists watch in awe as Colossus and the Russian supercomputer solve complex physical theories worth decades of man-hours, the machines start devising an implacable plan to set things right on Earth. Now, as you may have gathered from my brief summary, the story does feels dated. Colossus was released at the apex of the Cold War and the politics in the movie made sense back then, but the qualms between USA and Russia seem like a thing of the past now. That said, release this movie today and switch Russia for, say, China and you have a first-rate blockbuster thriller that smashes the competition (I’m looking at you Eagle Eye) – it’s that good. Don’t get the impression that Colossus is overly political either: above all, it is about understanding the motives of the supercomputer. On the human aspect of the story, we have an amazing performance by Eric Braeden as Dr. Forbin. As the designer of Colossus, he develops a strange relationship with the machine and eventually will find himself at odds with it. True, most of the performances feel a bit hammy but, then again, we’re talking about the 70’s here. Ultimately, you end caring and believing in the characters, which is all that matters. Trust me: this is essential viewing, folks. I had disregarded the movie until now because its plot seemed cliché on paper but it felt incredibly fresh and original. Computers gone crazy have become a staple of the genre but Colossus is one of the first examples and without question one of the very best. Like I said, the movie was exhilarating with many twists and pleasant surprises around every corner. A movie with science that works and keeps your attention up high until its breathtaking conclusion like this is a very rare treat, a gift from a long bygone era of creative filmmaking. Go get it. Now. 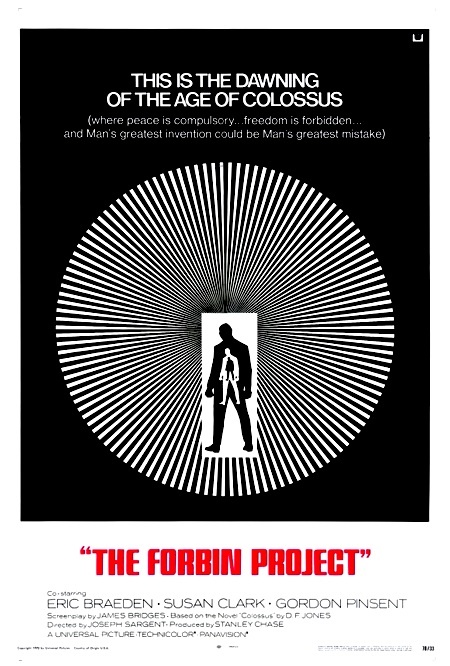 Colossus: The Forbin Project can be acquired from Universal Home Entertainment.